Advent once again, and we recall the beautiful lessons it teaches us – the preparation for the renewal of the First Coming of our Lord in hiddenness and mercy, and the preparation for His Second and Final Coming in judgment. We ourselves echo in the Advent prayers the longing of the Prophets of old: O come, O come, Emmanuel, God with us! Your Name and your remembrance are the desire of our souls. We have longed for Thee in the night, and early in the morning we have watched for Thee! In this Advent letter, we would like to tell you about Stephene. As so often happens when people order a special rosary from us, either for themselves or for a loved one, a friendship strikes up with the Sisters, warm, lasting and God-centered. So it was with Stephene. His eyes fell on the evergreen and the presents ‘neath the tree. So many costly things I’d bought. He looked at me and frowned. A Christmas finally came when we didn’t hear from Stephene, nor the entire year following. But we remember fondly in our prayers this good friend and “kindred spirit” in faith and love of God. The story in the little poem is one everybody can relate to; there are few of us who can say we have always kept the purpose of our Christmas giving in the purest perspective! 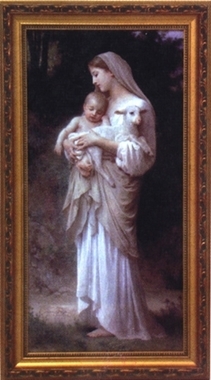 The reason we give gifts at all at Christmas is in memory of the greatest Gift of all given to us! So whether it is the pair of skates for Johnny and the sled for Suzy, an expensive computer gadget or just a simple, warm scarf, every gift is meant to be another “giving” of the Son of God among us all. 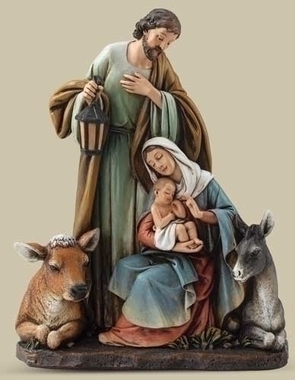 Pope St. Leo (d. 461) said in one of his Christmas sermons, “The gift surpassing all gifts is that God calls man His child, and that man calls God his Father,” and this is what the Birth of Our Savior began for us when He came to earth. 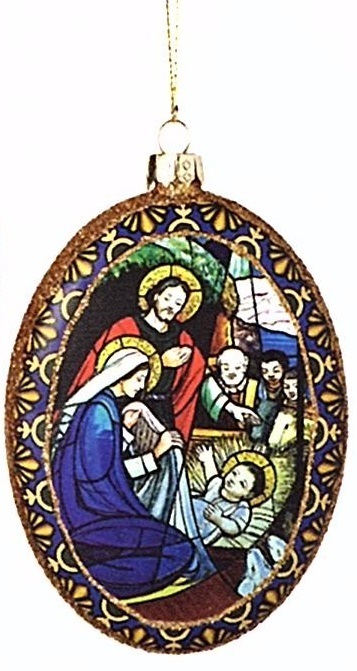 Below are some gifts, hand-picked by the Sisters – ideas for giving in honor of our Infant King. And since you know we always recommend good spiritual reading, here are a few special books to consider; be sure to browse all of our book selection, which we have big plans to expand and perfect on our new website! **One of our Sisters recently chose Abbot Marmion’s Christ, the Life of the Soul as a book to read again after many years – and she says it was a happy choice! 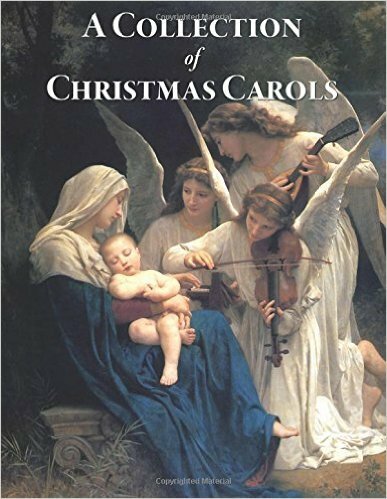 It is a beautiful study of the Divine Plan for our souls through Christ Jesus, the Author of life and sanctity: perfect reading during Advent, Christmas time and beyond. **All for Jesus is another Christ-centered book with practical guidance for making use of God’s gifts and growing holier every moment of the day. 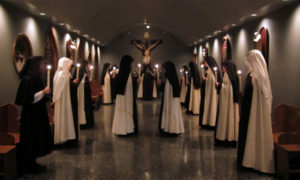 **A Sister who had to wait eight years to fulfill her Carmelite vocation found My Daily Bread a constant source of encouragement to keep close to God in her daily life while waiting for the fulfillment of His will in her life. This little book, small enough to fit in a pocket, is a classic. **Books make wonderful Christmas gifts for the little ones on your list, especially those that are both instructive and fun. 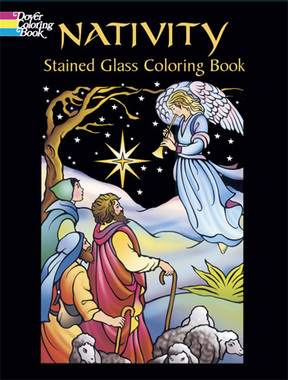 This lovely stained glass coloring book is a favorite with children. 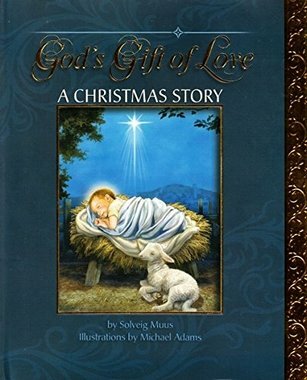 **The Christmas Story Book, though, is a collection for both children and adults – some of the very best of Christmas stories, beginning with St. Luke’s account of the Birth of Our Lord, and including O. Henry’s touching story, “Gift of the Magi” and Andersen’s “The Fir Tree”. As it has been all over the country, it’s been cold here! Very cold. As we write this letter, mid-day, the thermometer has yet to go above zero! A light snow is falling, and the powdery white on the deep-green trees makes our enclosure look like a winter wonderland. 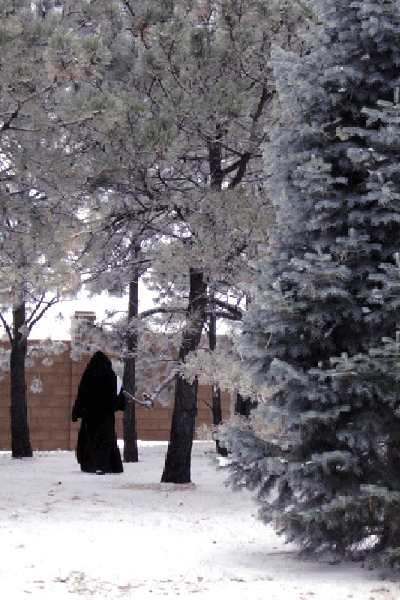 But it is very, very cold… We are keeping indoors for the most part anyway, since singing practice for the Christmas liturgy, rosary orders, baking and beginning our family and benefactors Christmas correspondence — and the last of the house-repair projects fill the work hours of our week. 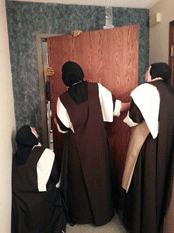 One of the house projects was replacing three doors on the lower floor of the Monastery. With help from our good friend, all-around “Project Man” Rick, we sanded, stained, varnished and hung these big doors. 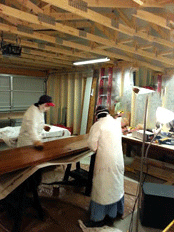 Thank Goodness for our Tuff Shed garage, which we obtained last year, that gave us plenty of room for this work! Each year, we return thanks to our many helpers with our baked goods and toffees. So these early days of December you will never find the kitchen empty. 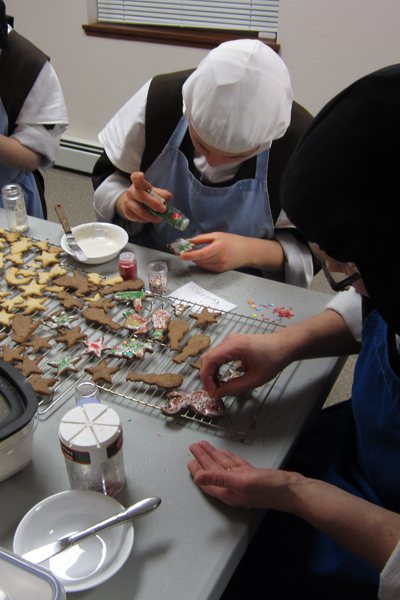 We carefully plan the baking schedule to be able to keep only a few Sisters working at a time, striving to keep our silence and solitude especially during these days of recollection and prayerful preparation for the Feast of the Nativity. 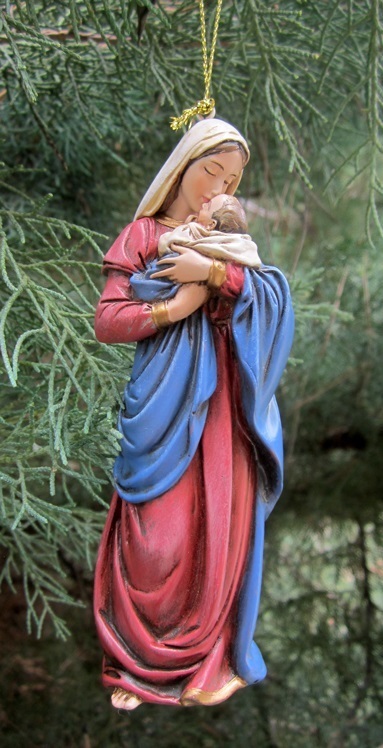 We pray you may receive the grace of Our Lord in an abundant share in this true spirit of Advent!